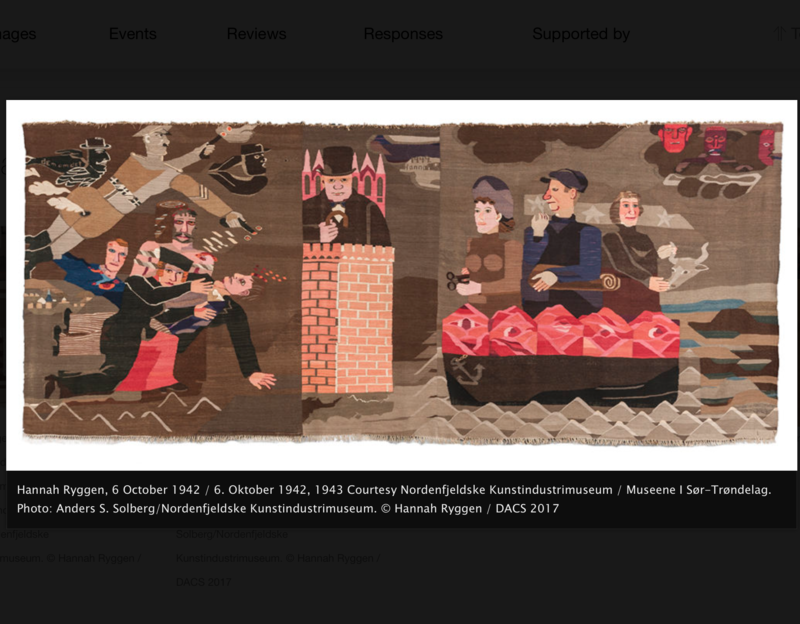 Hannah Ryggen (1894-1970) was a Norwegian self-taught textile artist, who took the socio-political issues of her era and wove it into her artwork. She was a pacifist living in a tumultuous time during the Second World War and her art was a direct response to what was happening in the world. All of her artwork is a new perspective on war, love and politics, from a woman’s and a mother’s perspective. This gives a deeper insight into the human condition and how war can have a profound impact on generations to come. The art ranges from portraying a mother’s heart to the threat of nuclear weapons. Throughout my time walking through the gallery, I realised that these events aren’t in the past, they are also our present. The rhetoric between world leaders today causes the world to become more anxious about the threat of a nuclear war. How do we as ordinary people deal with this? Ryggen’s way was to stand up and say something through her art in protest. The art may have been a form of therapy, finding a way to reconcile herself to the world she had to live in, giving her purpose in a time of helplessness as women had to say goodbye to the soldiers that went away to fight. This artwork brings attention to the damage done by war to the soldiers that come back from war with what we now know to be post traumatic stress disorder. Hannah Ryggen also took on key historical figures in her artwork, including Hitler and Winston Churchill. The psychology of these men is fascinating. This artwork kept bringing me back to this idea of connection: as human beings we want to relate and connect to each other but how can we do this when the world is fragmented? Ryggen couldn’t reconcile with her world of war and destruction, so she made her own efforts through her artwork. We now live in a world of different wars and we are faced with different issues, but what still remains the same desire for connection. This artwork is a connection to a world that we can still relate to today. - Emily Mackey is an A-level student. The exhibition runs until 18 February 2018.